This is the perfect vacation to see Italy’s highlights—from the historical treasures in Rome and the splendid art in Florence to the picturesque, medieval walled town of San Gimignano and the romantic canals in Venice. 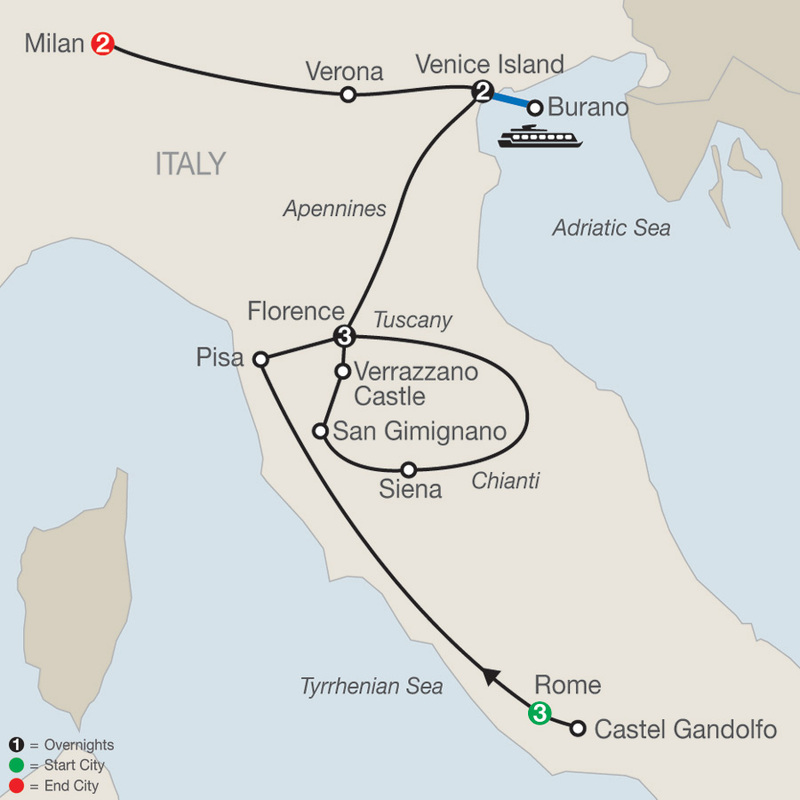 On this Italy tour, you’ll of course visit the famous sights on your sightseeing tours, including the Colosseum in Rome, St. Mark’s Basilica in Venice, the Sforzesco Castle grounds and museum in Milan, the medieval square in Siena, Juliet’s balcony in Verona, and the Santa Croce Basilica with Michelangelo’s tomb in Florence. You’ll even join a Venetian lagoon cruise to the picturesque fishing village of Burano, known for its bright pastel-colored houses.But that’s not all…Globus has also arranged special adventures and experiences for you on this Italy tour. For example, learn how Chianti wine is made and even sample some at Verrazzano Castle. In Rome, an expert Local Guide will take you to St. Peter in Chains, the 5th-century church that is home to Michelangelo’s famous Moses statue, commissioned by Pope Julius II in the early 16th century, and a true highlight is a guided visit to the Papal Palace and Barberini Gardens in Castel Gandolfo. Italy is an amazing country filled with beautiful art, magnificent architecture, extensive history, sumptuous cuisine, fine wines, and friendly people. You’ll experience its splendor on this fabulous vacation highlighting Italy’s most-treasured places. Be sure to pack your camera, because you’ll have plenty of photo opportunities along the way.